"Today's markets are rife with challenges that confound novice and professional investors alike. Thankfully, The Perfect Portfolio provides the type of 'outside the box' thinking that can enable individual investors to not only cope with these challenges but also to view them as profit-making opportunities." To achieve long-term success in today's market, you can't place your faith totally in financial "experts" who are far too often salespeople first and objective advisers second. You must take personal control of your hard-earned savings and build a portfolio that gives you a realistic chance of earning returns that enable you to meet the investing goals you really want to achieve in life. That's why Leland HevnerPresident of the National Association of Online Investors (naoi.org) and a longtime educator in the financial fieldhas created The Perfect Portfolio. This reliable resource outlines Hevner's proven investment approach, known as the Perfect Portfolio Methodology (PPM), and shows you how to use it to thrive in today's challenging market conditions. This is not the stuff of your average investing book. The author is not simply putting a new "spin" on the outdated investing concepts being taught today. He is providing nothing less than a dramatically new portfolio design model and a revolutionary approach to the entire field of personal investing. And this bold challenge to the status quo is long overdue! With The Perfect Portfolio as your guide, you will realize that investing does not need to be as complicated as the financial services industry would like you to believe. You will learn a simple methodology for building a portfolio that can produce incredible returns with minimal risk. You will be empowered to take personal control of your investments. It's time to start your new life as a confident investor. Leland B. Hevner is the President of the National Association of Online Investors (NAOI), which he founded in 1997. With thousands of members, the NAOI is the nation's premier provider of academically rigorous investor education to the public. Hevner is a recognized expert and innovator in the field of personal investing and has been interviewed and quoted widely in the national media. He has also provided consulting services to financial organizations around the world. Using the Supplemental Online Component. Part I. The Problem, The Solution and Getting Started. Chapter 1. The Woeful State of Personal Investing Today - The View from Main Street. Chapter 2. 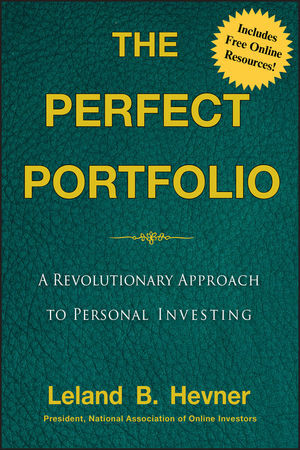 The Perfect Portfolio Methodology - A Revolutionary Approach to Creating A Superior Portfolio. Chapter 3. Building a Core Portfolio Segment - Establishing a Firm Foundation. Part II. Supercharging Your Portfolio with Target Market Investing. Chapter 4. Building a Target Market Portfolio Segment - Five Asset “Building Blocks” That Will Supercharge Your Portfolio. Chapter 5. Adding Gold to the Portfolio - An Investment with Intrinsic Value. Chapter 6. Adding Energy to the Portfolio - An Asset That Runs the World's Economy. Chapter 7. Adding Agricultural Commodities to the Portfolio - The Staples of Life As A Staple of Your Portfolio. Chapter 8. Adding Real Estate to the Portfolio - Considering a Truly Unique Asset. Chapter 9. Adding Emerging Markets to the Portfolio - Exploring the World for Extraordinary Returns. Part III. Creating and Working with Your Perfect Portfolio. Chapter 10. Designing and Modeling Your Perfect Portfolio-Building A Portfolio For Your Unique Needs. Chapter 11. Implementing, Monitoring and Managing Your Portfolio - Keeping Your Portfolio On Course In Changing Conditions. Chapter 12. Maximizing the Potential of Your Perfect Portfolio- Transforming Involvement Into Wealth. Summary. Reviewing, Teaching and Experiencing the Perfect Portfolio Methodology. Appendix. An Example PPM Building Block Trading Plan.